NASA's Hubble Space Telescope captured a stunning new view of a spiral galaxy that wandered too close to the massive Coma galaxy cluster and is being stripped of its gas. While D100 is one of many galaxies in this situation, one factor distinguishes it from others that astronomers have seen and modeled: D100's tail is much more smooth and well-defined than most such galaxies, according to the study. "This is a surprise, because a tail like this is not seen in most computer simulations. 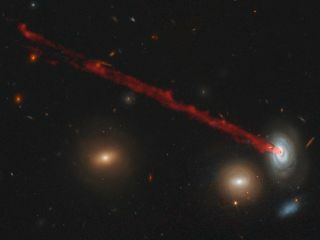 Most galaxies undergoing this process are more of a mess," Jeffrey Kenney, a co-author on the study who's also at Yale University, said in the statement. "The clean edges and filamentary structures of the tail suggest that magnetic fields play a prominent role in shaping it. Computer simulations show that magnetic fields form filaments in the tail's gas. With no magnetic fields, the tail is more clumpy than filamentary."